“Katlamara Chalo”: A call for design and political action using the “Seedlings of Wealth” strategy for rural development in India. Image 01: A collage of images from the field workshop in May 2005 at Katlamara in Tripura State. A cultivated field of Kanakais bamboo at Katlamara, one of over two hundred such fields in the area. Nomita Debbarma with the DDPJoint and Nomita with Bani Urang at the drill machine set up during training sessions in summer of 2005. Samir and Ranjit the master trainers who worked with the design team in the field. Image 02: Seedlings of Wealth model that was proposed in 1995 at the Bali Conference was implemented at Katlamara and the book about the field work and design strategies are now available between the folds of this cover, in a 64 page book titled “Katlamara Chalo: A Design for Development Strategy” (see link below or download 46.5 mb pdf file here). 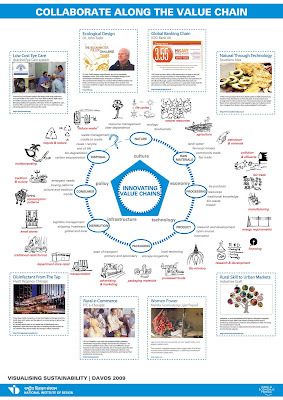 Image 03: Sample pages from the “Katlamara Chalo” book – illustrated pages that introduce the strategy as well as show the products and the story so far. 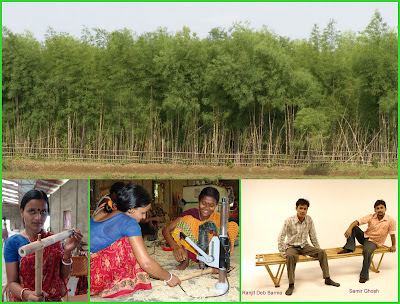 Since this project in 2005 we have extended the range of products as well as conducted additional training for craftsmen from adjacent village clusters as part of the Tripura Bamboo Mission initiatives. Design at the strategic level is not well understood in India or for that matter in many other parts of the world and in most cases almost all of the development success is attributed to the good use of science and technology and of management and planning skills while contributions from design are all but ignored. This is also reflected in the scale and frequency with which science and technology efforts and research are funded by our governments and in India the science and technology sector draws several thousand times more funding for development initiatives and the case for the use design is only considered if one of us, faculty from the design Institutes, happens to be present at some critical government or planning board meeting and we speak out in support of using design as a development resource. 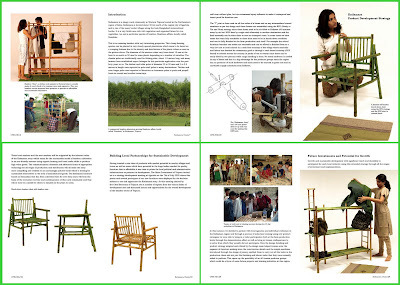 The furniture development using the Katlamara bamboo for the rural development strategy is just one leg of a multi-pronged, multi-location and multi-year design and development effort that we have been pursuing at the NID Centre for Bamboo Initiatives over the years. We are pursuing this to show an even larger story that design at the strategic level (as we understand it at NID) can be a great and powerful force that can transform India if it is used in the 230 sectors in which it is needed but unfortunately which is not yet understood when compared to the manner in which with science and technology and management is understood in India. Many industrialists and government officials in control of development funding still think that design is a cosmetic addition to technology but this is far from the truth although the design media (in India and across the world) still seem to focus on fashion and aesthetics aspects of design and this I call "page 3 design" and I wish to promote the strategic design initiatives in India across all the sectors of our economy. Image 04: A collection of products developed as a follow-up to the Katlamara Chalo Workshop. 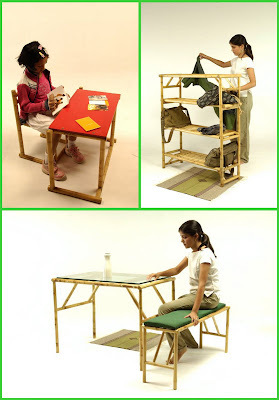 The Dismantling and stackable tables, benches and storage racks are based on the component stackable configuration developed by Sandesh R using the Katlamara Bamboo Joint using the DDP strategy. This is an ongoing engagement and after the project in 2005 we have had the occasion to revisit the project location as well as collaborate with a number of partners in furthering our objectives of providing development interventions using design strategies of product diversfication and matching these to local capabilities as well as aspirations. In recent times we have a major project with the Tripura Bamboo Mission where we helped develop a new collection of products that could sustain local markets and these were introduced to local craftsmen in an effort to seed local entrepreneurship based on local demand. This “local to local” strategy saw the design team focus on one product category called the “Alna” a local favorite, a clothes rack, which is found in every home in the region, but is rarely made in bamboo. I have reported about this collection in a recent post which can be seen at this link here. Indian Saris: Woven fabrics of fantasy and folklore – A new book from NID on the subject of design will soon hit the stands. Image 01: Vijay Singh Katiyar reviewing pages of his new book “Indian Saris” in his office at NID, Ahmedabad. Something to celebrate has come up and I will share this with you. A new book is to be launched shortly by one of the faculty colleagues at NID, Vijai Singh Katiyar, of the Textile Apparel Design Faculty is ready to launch the new offering called “Indian Saris: Traditions – Perspectives – Design” which is published by Wisdom Tree, New Delhi. Katiyar has a blog on the subject, which promises to tell us all the details as they unfold in the days ahead and I do wish it all success as we move forward from here. I have not yet had a chance to read the book and post a review but the fact that such a book has been created is a welcome event since so little has been published on Indian design and I welcome all these contributions with an open mind and hope more people will come forward to share their insights and experiences and this would apply to all my faculty colleagues at NID and at other design schools across India. There is much to be done in this space. 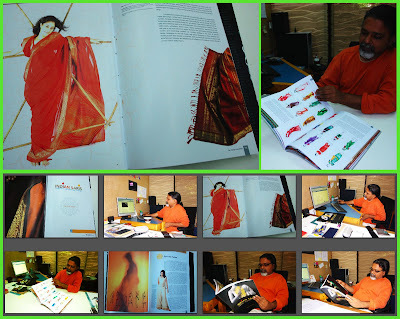 Image 02: Glimpses of the new book “Indian Saris” in the hands of the author, Vijai Singh Katiyar. NID Faculty in 1993 and he has been working at NID since then in a number of capacities including administrative roles and teaching roles that cover education, research and projects as part of any faculty member’s activity at NID. In recent years Vijay Singh Katiyar carried out several sari design and development projects for the States of Tamilnadu and Kerala and these have helped support his deep research into the subject of woven sari production which is the subject of his book. We will hear more about the book after its formal release that is to take place in London at the Nehru Centre on the 20 April 2009 at an evening function that promises to be an intellectual and stimulating social event since the Indian High Commission in London has agreed to host a panel discussion titled “Design for Indian Textiles & Fashion: Tradition to Modernity – A UK – India Deliberation” as a curtain raiser for the evening event and the book launch. More about this event at the blog “Indian Sari”, here. I was told that Wisdom Tree has arranged for pre-orders at a number of online booksellers including Amazon and I hope that the book is well received by the design community. Image 03: Goddesses and mortals draped in the sari as visualized by Raja Ravi Varma who has influenced India in how we see ourselves and our deities in more ways than we can possibly imagine. Lakshmi, Saraswathi – Hindu Goddesses and mythological characters from the Mahabharatha – Damayanthi and Nala story, as well as the Shakuntala story, all depicted with the sari clad persona as imagined and visualized by the great artist. The impending launch of the book gives me an opportunity to reflect on the topic of the book, the Indian Sari. A length of cloth, sometimes plain and at others highly decorated, the sari, has been the source of many fables and a fabric of our imagination as a society and a culture. While working on this post I looked up the Wiki on various aspects of Indian garments and the Sari in particular and was amazed at what we can find on the subject online today. I came across Raja Ravi Varma’s depiction of sari clad goddesses and immortal mortals – our mythology is full of their stories - as well as stories of love and intrigue all part of the Indian cultural traditions, some I remembered from my childhood stories told to me by grandmother and also my father. Nala and Damayanthi, Shakuntala, Uruvashi and Puraravas – were all depicted by our visionary painters – as sari clad women and men in draped garments, in their various settings and here Ravi Varma has taken hold of all our collective imaginations of how we see our past through his realistic paintings that got transmitted to us through the rich tapestry of the calendar art from the hot printing presses of Shivakashi and elsewhere, to reach every nook and corner of India, in the tea stalls as well as in the homes. “Bharat Mata” – Mother India – was shown in a sari on matchbox labels and all of these images contribute to our collective imagination of India and the Indian reality, if there is one such singular thing that can be called the “Indian reality”. I do not know how much of these aspects are covered in Vijay’s book but I will look out for it when it reaches my hands, hopefully soon. Image 04: Images of Uruvashi as visualized by Raja Ravi Varma on the left and by Ramachandran on the right. The stories of love and life as well as the depictions of Indian women in theatre, film and in print have been in sari mode for the past 5000 years of our civilization. From the expressive depictions of the sari clad goddesses in cave paintings to the realistic images of Raja Ravi Varma and the depictions of the love story of Uravashi and Puraravas by Verma and later by Ramachandran show just a tiny fraction of our visual landscape and story-scapes which has been the images of our mythology on which all of us have been educated in the real world that is India today. The sari continues to thrive in rural India while urban India has adopted various new forms of expression – from the salwar khameeze to the business suit in the BPO’s and IT enabled offices around the nation and ofcourse the jeans and T-shirt of our schools and colleges. New visions of feminine expression have emerged and the sari still plays a role in a number of fashion interpretations and it will be interesting to see how the Indian imagination and fashion will shape the sari of the future. I have requested the NID Library and Knowledge Management Centre for a full list of original documents in their archival collection which deals with the design of saris and they have promised to give me a list of Craft Documentations, Craft Design Diploma Projects, Faculty Research Projects and Faculty and student sari design projects that were carried out at NID over the years. I am told that there are many and none of these have been published so far so I will bring out a full list as soon as I get the copy from the library, hopefully very soon. I remember several memorable sari design projects done by NID faculty in the past and I do hope that these are also published at some point even as pdf documents that may be available from the web, why not? Gitto, Aditi and Krishna had all done saree design projects and more recently Vijai too has completed his own collections and I do hope that these are all made available through the NID Library soon as a result of my request here. 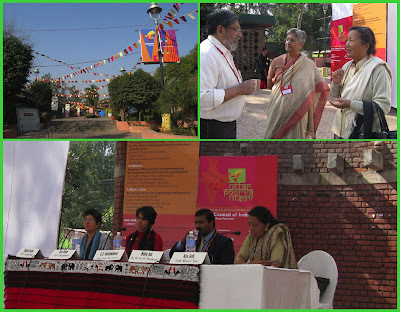 Design overview lecture delivered at the “Uttar Purva Utsav” organized by the Crafts Council of India at the “Dilli Haat” on 2nd February 2009 to celebrate and promote the crafts of Northeast India in association with the Development Commissioner of Handicrafts, Government of India. The lecture was simultaneously translated into Hindi by Ms Asha Bakshi, Dean Fashion Design, National Institute of Fashion Technology (NIFT), New Delhi. Image01: Speakers at the “Uttar Purva Utsav” organized by the Crafts Council of India at Dilli Haat in early February 2009. This invitation to speak at the “Uttar Purva Utsav” organized by the Crafts Council of India at the “Dilli Haat” gives me the opportunity to reflect on my three decade old association with the crafts of the Northeastern Region of India and to ponder on the lessons that we have learned about design and bamboo from the craftsmen of the Northeast over the years since our first contact with their work in the field in late 1979. We began our year long fieldwork November 1979 in the Northeast as part of the project sponsored by the All India Handicrafts Board in those days, now the Development Commissioner of Handicrafts [DC (H)], to study the bamboo and cane crafts of the region which resulted in a book which was eventually published in 1986 by the DC (H) and the National Institute of Design (NID), titled “Bamboo & Cane Crafts of Northeast India” by M P Ranjan, Nilam Iyer and Ghanshyam Pandya. (download book here as PDF file 35 mb size) It is also an opportune occasion to connect once again with the resources that were generated by that project particularly in the form of the very large collection of baskets that were collected in the field as part of our study and these are today available at the National Crafts Museum and I am told that these are on special display to celebrate the crafts of Northeast and in conjunction with this particular event at the Dilli Haat. The craftsmen and the crafts promoters are invited to visit the National Crafts Museum at Pragati Maidan and see for themselves the quality of crafts that is still a living tradition of the region as these products are still in active use across the region but times are changing fast and these may not remain that way for very long. Digital pdf copies of my book can be downloaded from my website and in-print copies of the paperback edition (2004) are available from both NID and the DC (H) and the original hard-bound edition (1986) is now out of print. Image02: The Paikawng from Mizoram, side and top view seen with drawings of the base, sides and rim construction and the detail of the base strengthening detail using cane binding over a bamboo base. I must share the learning that we were able to glean from our journeys into the Northeast as well as from our interactions with the local craftsmen which was followed by a period of deep study that we could invest into the collection of 400 baskets that we had gathered during our field work in the Northeastern region. Besides giving us numerous insights about bamboo that were invaluable we were also quite surprised to see the deep appreciation of design principles that were both applied by the craftsmen as well as something that we found embedded in the range of products that we had collected in an extremely selective manner during our year long field work in the seven states of the Northeastern region. Now Sikkim has been included in the definition of the Northeastern Region and rightly so, since these states share so many common characteristics with each other while keeping their individual identities intact. Learning from the Northeast’s craftmen was an exhilarating experience and in all very enriching experience. As a designer and a design teacher traveling with two colleagues through a culture that was rich with knowledge about bamboo and design it was a stimulating experience for us and a huge source of new learning from the field. This learning we tried to capture in our book about the Bamboo and Cane Crafts of the Northeastern Region and while the content may look like a normal documentation a look at the back of the book will reveal a meta-structure of information and local knowledge contained in two indexes, one a “Technical index” that captures all the nuances of the local wisdom across many fields and the other a “Subject index” which links and makes accessible word concepts as they appear across the book. Our sense of amazement at each product that we saw and the level of detail to which the thought process had helped evolve that product was always a source of great pleasure, amazement and admiration. From all these products I would like to draw out one specific example, The Paikawng, a Mizo basket used for carrying firewood, not because it stands above the rest but simply because it is one of many products that come to my mind as I stand here and reflect on our deep learning from the field about design itself. I will therefore use the example of the Paikawng to set out the boundaries and contours of the three orders of design as they appear in the fine hand crafted baskets of Northeast India. 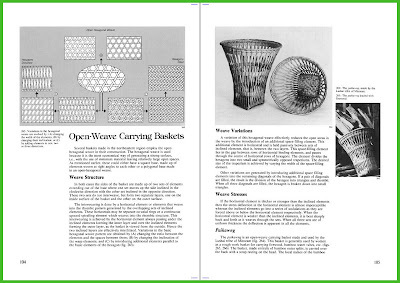 Inage03: A general understanding of structure of baskets from Northeast India from our book along with two particular baskets from the Tengnoupal hill district of Manipur State, one closed-weave for grain and the other open-weave for grass and fire-wood. Let me first give you an overview of the three orders of design that I shall be dwelling on over the next few minutes. What are these and how do they relate to our understanding of design and in particular how these can help us use design to further our objective of building better products and systems for the people of the Northeastern region? The fine detailing in the baskets from the Northeast represent the climax of a bamboo culture and the field study and our book tries to pay homage to that spirit. The three orders of design are listed here and I shall proceed to explain how these were appreciated in the Paikawng and in all the other products that were equally rich and deserving of our attention. This level of design is recognised by all people and is the most commonly discussed attribute. Here material, structure and technology are the key drivers of the design and these help shape the form that we eventually see and appreciate in the product. We can appreciate the product as an honest expression of structure and material used and transformed to realize a particular form that is both unique as well as functional. It is here that skill and understanding of the craftsmen are both used to shape the product through an appropriate transformation of the material with an understanding of its properties and with an appreciation of its limitations and possibilities. 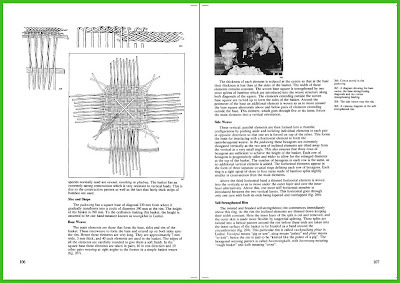 Image04: Description of the open-weave structure and its varients from the Northeast and the Paikawng shown in use for fire-wood carrying from the pages of our book. Let us take the Paikawng and examine it at the level of material and form – this basket is made of long strands of stout bamboo splits that are first interlaced to form a square base before these are bent up to form the sides of the basket. In forming the sides these very same splits form elongated hexagons that are a result of the three horizontal bands that anchor the inclined verticals between the base and the rim structure. At the rim these splits are each divided laterally into a number of sub-splits which lend themselves to a form of braiding so as to create a wide braided band that is both soft as well as very strong but being flexible. The material of the split is thus transformed at each stage, the base as flat and wide, the sides as thick and stiff and the rim as soft and flexible, while still remaining one single piece of bamboo that is responding to a particular structural need at the point where it is needed. The four corners of the square base are covered by a interlacing knot, each made of a length of cane splits which does not unravel easily if some of the overlapping strands are cut while the basket is in use. Cane, here is used sparingly to conserve costs and to save the critical part of the bamboo basket from friction and were and tear at the corners which are the most vulnerable parts of this basket when in contact with the ground. Further, this additional feature can be renewed or replaced in case of damage in use and the whole basket would therefore have an extended life. This lends the basket a degree of toughness that is essential for the intended function, which is to carry rough cut fire-wood from the field to the home and this brings us to the second order of design. This level is influenced by utility and feeling and is largely determined by the marketplace as well as by the culture in which it is located. Here aesthetics and utility are informed by the culture and the economics of the land. We can sense and feel the need for the product and the trends are determined by the largely intangible attributes through which we assess the utility and price that we are willing to pay for this particular offering and this is quite independent of its cost. 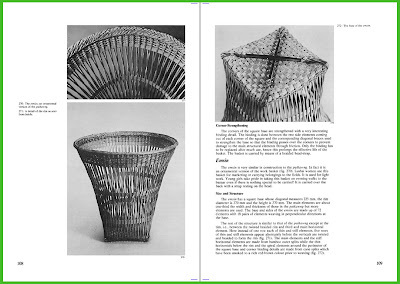 Image05: Pages from the book “Bamboo & Cane Crafts of Northeast India” showing the construction of the Paikawng in line drawings of base, sides and rim structure with description of its uses at home and at work. In order to examine this level of design we will need to compare similar products across a number of different social and cultural situations. Firewood baskets are made by many communities of the Northeast and each of these have a distinctive form that is informed by the asthetic preferences of that community. The Paikawng offers the Mizo a particular form and structure and for lighter applications they have a sister product called the Emsin which is lighter and smaller than the Paikawng but with very similar structural and formal characteristics of the latter. The other tribes have distinctly different forms that are arrived at by differences in the size, shape, contours as well as the shape of the hexagon used to form the sides of the baskets in question while addressing the same set of functions that the Paikawng addresses for the Mizos. This level is shaped by the higher values in our society and by the philosophy, ethics and spirit that we bring to our products and events as well as all the associated services and the stories that we can tell about the relationships between these entities and our lives. At this level value unfolds through the production of meaning in our lives and in providing us with our identities and these products becomes a medium of communication itself, all about ourselves. It is held in the politics and ethics of the society and is at the heart of the spirit in which the products are produced and used in that society. There are deeply held meanings that are integral to the form, structure as well as some of the essential features which may in some cases be the defining aspects of that product, making it recognizable as being from a particular tribe or community. These features define the ownership of the form, motif or character of the product and these are usually supported by the stories and legends about their origin and these give meaning to the lives of the people for whom they are made. Image06: Views and description of the Emsin, a sister product of the Paikawng which is used for lighter tasks and as a ‘fashion’ product by the Mizo youth for visits to the bazaar and other light chores. The Paikawng has this distinctive character and can be recognized as a typical Mizo product both by the Mizos themselves as well as by those around them. The braided band at the rim has a unique name in the Mizo language – it is called “vawkpuidang phiar”, meaning “the braided pattern or palete of the pig or sow” which has a similar knitted pattern. These stories bring value to the product that goes far beyond its material and utility value that is usually embedded in such functional products. We need to recognize the characteristics that these three orders of design bring to the contemporary products of our own society and in doing so we can learn to enhance the value that it brings to the market as well as tone the quality standards that are applied to each instance of these products at the various stages of production, marketing and utilization in the society. All three layers are important and we need to learn to appreciate our creations along all three axis if we are to reach a sustainable offering in the handicrafts sector in the days ahead. Design therefore has a number of layers that are addressed in our traditional artifacts and when we embark on the making of our new and innovative products for new markets we will need to pay a great deal of attention to all three orders of the design spectrum if we are to reach a semblence of sustainability and order in our creative offerings for the future. 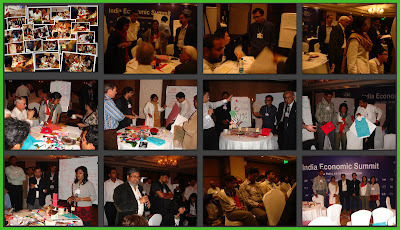 Image01: Views of Sustainability Design Charette at New Delhi on 15 November 2008 as part of the India Economic Summit which was organised by the World Economic Forum. C. Building the Framework Conditions. Image02: Views from the two day Visualising Sustainability Workshop conducted at NID on 26 and 27 December 2008 for a hands on session for visualising approaches to sustainability along six selected themes. The push for the follow up meet at NID would now be to understand the ideas that will leverage these broad frameworks into the future. The aspects that currently maintain the status quo must be examined, and concepts that will bring about transformation will have to be envisioned and articulated. The broad themes have to therefore be detailed, visualised and made tangible. In order to take these themes forward, the National Institute of Design (NID) proposed a two day workshop, ‘Visualising Sustainability for Davos 2009’ and the same was organised on the 26th and 27th of December 2008, where six multidisciplinary teams of design students, faculty, and invited experts explored these six themes, in order to create detailed concepts within each of these broad frameworks. 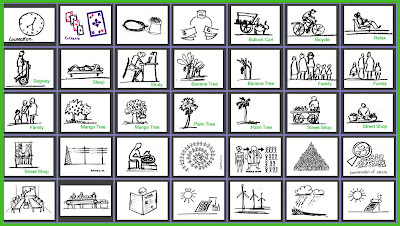 Image03: Selection of thumbnail sketches that could capture various themes and issues associated with sustainability visualisation as a preparation for the poster making that would follow. The outcomes of this workshop was further developed by a core team of three faculty and five students at NID so that these could be presented at the “Sustainability for Tomorrow's Consumers” Governors Meeting Session, on the 29 January 2009. 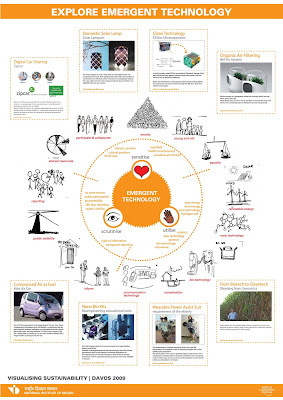 What emerged was a set of five posters that drew on the six key themes that were proposed earlier in consultation with the World Economic Forum organisers through online and telephonic discussions while the core team developed the concepts and visualised the specific themes at the NID, Ahmedabad. 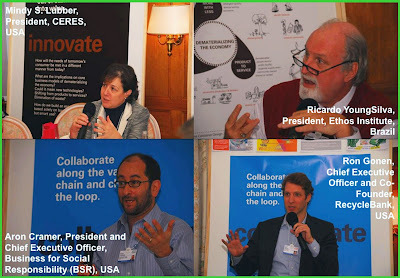 Image04: Posters on five themes that were sent to Davos for the closed door meeting of CEO's that discussed various approaches and strategies for sustainability in the business world in the days ahead.Let us look forward to their proposals for all of us. 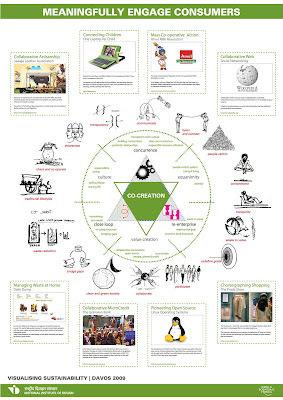 The five posters are offered here as printable A3 size PDF downloads for use in schools and business settings alike to stimulate the use of design thinking and sustainable practices in the creation and delivery of new and improved products, services and business strategies that are sustainable – both people as well as environment friendly – in both thought and action. 0. 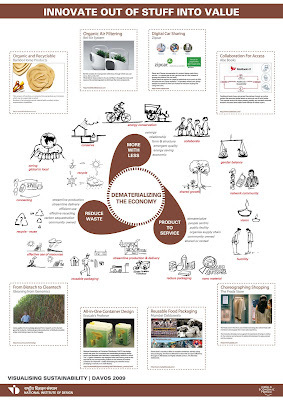 Poster introducing the set of five posters on sustaibnability and the process of making these for the World Economic Forum in Davos 2009. 6. Full set of six posters as a compact booklet in A3 size_4 MB pdf. 7. Full set of six posters as a printable booklet in A3 size_16 MB pdf. World Economic Forum – Feedback from Davos. 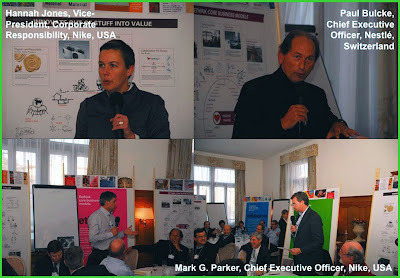 Image 01: CEO’s of major global corporations at the Sustainability session at Davos using the NID designed posters. We got a brief message from Davos on 31 January 2009 from Marcello Mastioni of the World Economic Forum on the successful completion of a collaborative journey between NID and the WEF that started last year with the Sustainability Design Charette in New Delhi on the 15 November 2008 about which I reported earlier on this blog. 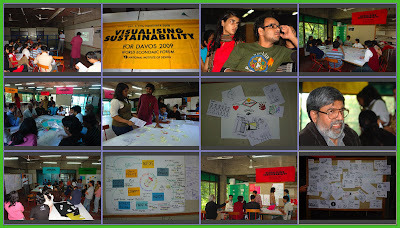 The event on sustainability took place at Davos on the 29 January 2009 using the visual materials that were designed for the purpose by students and faculty teams at NID through a two day workshop on the 26 and 27 December 2008 which was followed by an intensive effort to capture all the insights into an expressive set of five posters shown below. The Sustainability meetings have been successfully completed, but the Davos Meeting is not over yet, and we are still busy closing it. You will forgive us for now for not reaching out with as many details as it would be appropriate. The sessions went very well, with extraordinary participation and with the definition of a clear mandate for action in 2009, which was our primary objective. The visuals contributed greatly to creating a conducing environment that would inspire the CEOs towards innovation and collaboration. The pictures the official photographer took are not yet available to me, but I wanted to attach a few pictures to show you how close we put our leaders to the visuals, and the type of environment we created for the event. Many thanks again for your extraordinary support. We look forward to talking to you in one week or so for a more thorough debrief. Image 02: World business leaders meet world thinkers on sustainability at Davos 2009 and use the NID designed posters on Visualising Sustainability. In an earlier message on 23January 2009 sent to us after we had submitted all the five posters Marcello informed us of the intentions of the WEF in using the posters at Davos this year. I wanted to take a moment to say a big thank you to all of you. The posters are printed and on their way to Davos, where they will be featured in an event with 50 participants, including the CEOs of companies such as Nike Inc., The Coca-Cola Company, Unilever, Land O'Lakes Inc., Nestlé SA, Monsanto Company, Young & Rubicam Inc., METRO Group, Best Buy Co. Inc., Yara International ASA, IDEO Inc., The Olayan Group, nGenera, The Reitan Group, S. C. Johnson & Son Inc., Kraft Foods Inc., General Mills Inc. and Dow Jones & Company Inc., amongst others. Everybody here expressed wonder and admiration on the work done. You have been very courageous to tackle such a complex systemic issue as Sustainability with an open universal approach, and then go through the immense task of distilling the discussions into meaningful conclusions and relevant visuals. You had success at your mission, and you can proud of that. Please let us praise your achievement. I won’t of course miss to keep you in the loop as things develop here. I will make a detailed post about the process of exploration, cooperation and design that we used to make these posters and the various players involved in this process at NID and at Geneva office of the WEF. I include below images of the five posters for immediate reference and pdf files will be made available soon along with the posts that follow as the story unfolds. 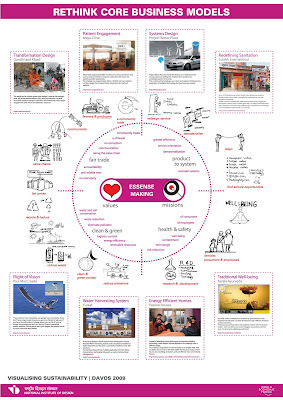 Image 03: Essence Making: Rethinking the Business Models. 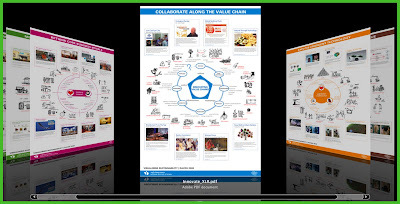 Image 04: Innovating the Value Chain: Collaborate along the Value Chain. Image 05: Co-Creation: Meaningfully Engage Consumers. Image 06: Dematerialising the Economy: Innovate out of Stuff and into Value. Image 07: Emergent Technology: Explore Emergent Technology.